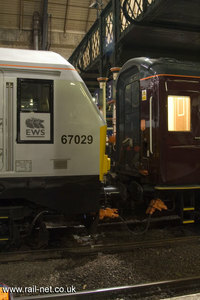 The EWS Mystery tour train is being used around the network to train drivers. On December the 30th it was Temple Mills Bound. 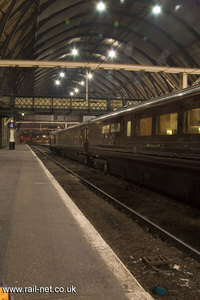 On it's first official working The Scooby Skip and the Mystery Train, or the EWS's Managers Train to give its proper title, worked from London Kings Cross to Doncaster in the morning and then returned in the evening. The train arrived over 30 minutes early at Kings Cross. This train will become a familiar sight in the months to come as it tours round the network. A big thank you to Mr Howe for his updates during the day. The EWS Managers train ambles slowly north through Stevenage Old Town en route to Doncaster. 82146 leading, 67029 pushing from the rear. 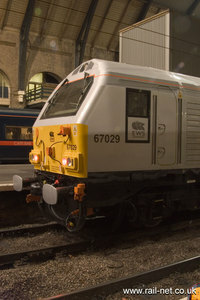 The EWS managers train is pushed into Kings Cross by 67029. With cameras mounted at both ends the train is equipped with plasma screens so that the guests can see where they are going, or where they have been!